“These bikes are notorious for never starting when you want them to,” says Jim Whittington, owner of Cape Town-based bike restorer The Bikes that Jack Built. Ignition on. Check the amp meter — that tells you where the piston is. Squeeze the decompression lever in, and slowly kick it over while you watch the amp meter needle flicker from minus then up towards the plus sign. “Nina Noir”, his ride, is a 500cc single cylinder Royal Enfield built in 1963. I am on “Marilyn Maroon”, a year younger than Nina but restored to the same exacting standards. Fuel on. Watch the needle. Stand. Kick. The red bike throbs into life. Piece of cake. We roll down the Sea Point boulevard, drawing longing looks from drivers sweating in their boxes. 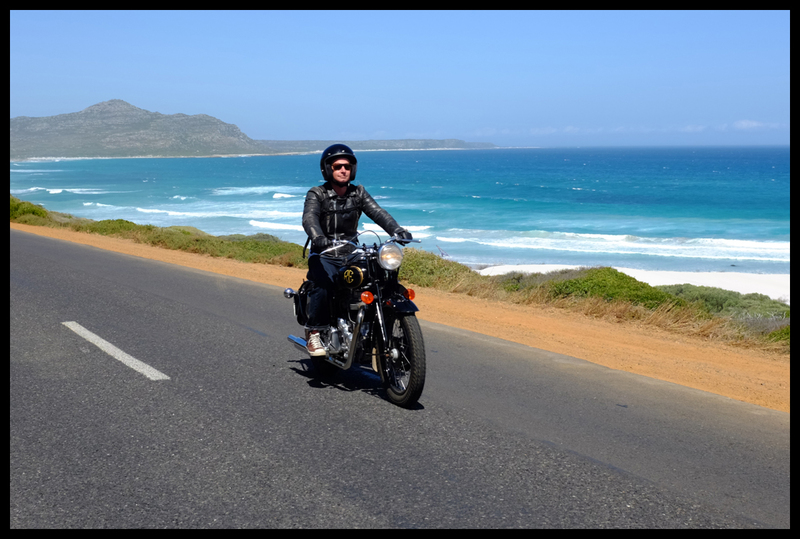 After Bakoven, where the exquisite coast road opens into a series of gentle, swooping bends, I twist the throttle and feel the Enfield respond like a willing if elderly pony. We flick through the bends at an earth-shattering 80km/h, tappets, engine, exhaust and slipstream roaring in my helmet like a winter gale. The bike purrs and throbs. I have sun on my hands and the smell of sea salt and kelp in my lungs, and the flash of blue sea and glistening boulders and the sweet, spicy fynbos rushing by. Rolling through the fine S-bend above where the old tanker Antipolis came to grief in 1977, I flick my hips and whoop and feel better than every poor citizen stuck in the meat grinder on this late-summer day. When Whittington landed in Cape Town from Wales he was entranced and who wouldn’t be? “Remembering what it was like seeing Cape Town for the first time and being blown away, I thought if you can get people on these bikes that are in themselves amazing and that people love and on top of that show them Cape Town at a leisurely thumping pace… it seemed too good a combination,” he says. The result is a touring arm to his business of restoring old Royal Enfields. Riders get to use bikes from Whittington’s personal fleet. “I have too many bikes,” he says. All are 1960s Royal Enfields, sourced by his team of searchers in India. The bikes are shipped to Cape Town where Whittington’s mechanics get to work on finding what he calls each machine’s “inner beauty”. The bikes are rebuilt from the wheels up. Some are custom jobs, others nut-and-bolt restorations, using new parts from Royal Enfield in India. India’s love of the marque cannot be overstated. 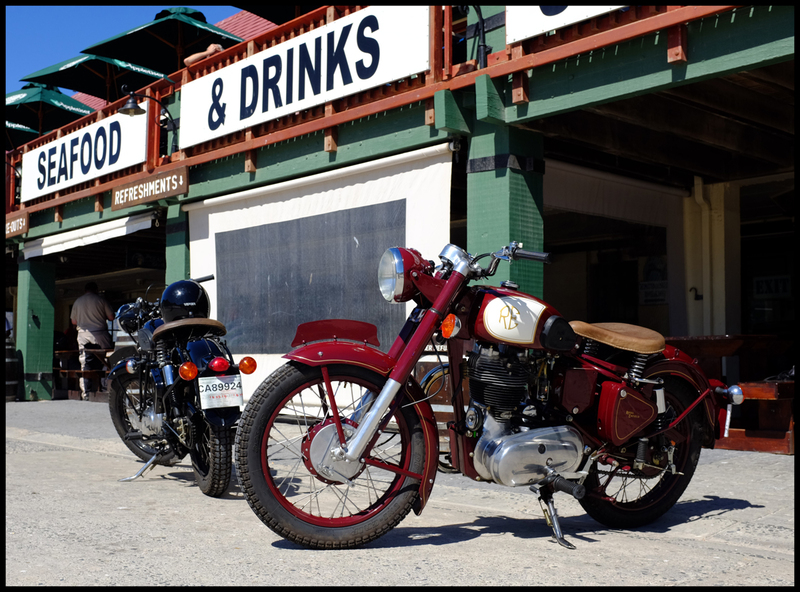 After Royal Enfield moved its factory there from England in 1955, the bike became part of the fabric of the sub-continent and a symbol of aspiration and success. “India adopted Royal Enfield as its own a long time ago,” says Whittington, who first saw the potential of bike tours while travelling in India. “I’ve been going back to India a few times a year to see my bike builders and to do rides over the Himalayas and it struck me there’s not anything like it here, using these old British machines that are very capable and amazing to ride,” he says. And they are easy bikes to ride: well-weighted, low on the ground and not super-quick, which is a good thing. We fly down Suikerbossie and pause for pictures at the wharf in Hout Bay. A small crowd gathers to stare at the gleaming machines. A security guard boasts that he rides a scooter “from here to the Flats in 20 minutes”. Whittington raises an eyebrow and smiles and says nothing. We pull off on a little lay-by at the south end of Chapman’s Peak to watch the surfers. A Frenchman picks his way down the edge of the road to look at the bikes. He is on holiday after a triple-bypass heart operation. He is riding a scooter. He loves the Enfields. “Next time,” he says wistfully. Our route takes us through Kommetjie and Misty Cliffs, Scarborough, up through the sunstruck fynbos to Cape Point and down past Smitswinkelbaai. The pace is leisurely and drivers — as if repelled by a magnetic force — slow down and laugh and gawp and follow slowly, maybe hoping the magic will rub off on them. We stop at Boulders Beach to see the penguins. A KLM pilot and his shiny-eyed flight attendant companions coo over the bikes. Their eyes flicker with something which is not quite sadness but something else. Maybe it’s the sun, and the smell of sea air and the sight of penguins waddling like Charlie Chaplin over the rocks. I know what it is. It’s the recognition of a fleeting moment of freedom. “You see,” says Whittington, starting his bike with that kick that makes the hosties go weak at the knees. We have a late lunch at Kalky’s. With a steaming plate of fresh hake and the best chips in the Cape, it is not hard to see how the elements have all come together. Good air, pretty country, a simple lunch on a harbour quayside and a long ride on an old, well-mannered bike. Who wouldn’t fall for that? 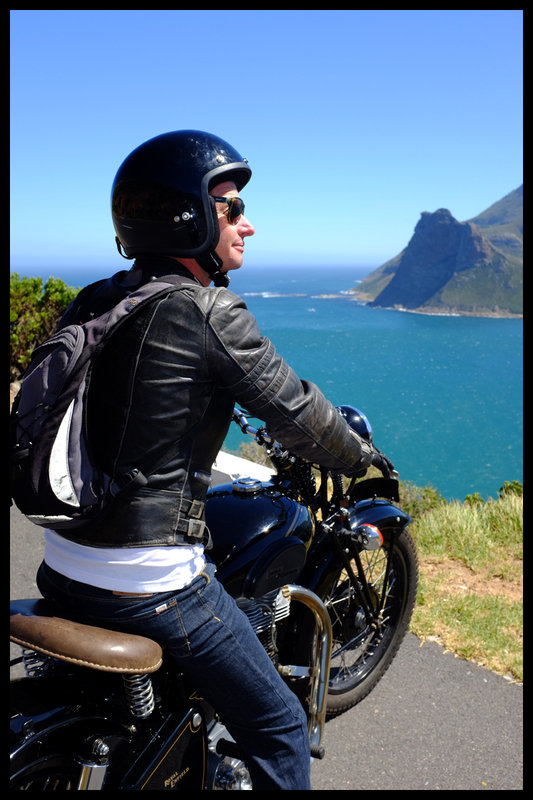 HOW TO DO IT: Cape Peninsula and winelands day trips cost R1500, including lunch, riding equipment and the use of a fully restored and gassed-up Royal Enfield. E-mail jim@thebikesjackbuilt.com or go drool over the bikes at www.thebikesjackbuilt.com. If you want your own, prices start at R85 000 for a practical bike that you can use every day of your life.